NEW DELHI, India, June 24, 2013 (ENS) – India and the United States will combat global climate change, collaborate on energy security and support the development of low-carbon economies to fuel job growth in both countries, government officials said today in New Delhi. At the annual U.S.-India Strategic Dialogue meeting, U.S. Secretary of State John Kerry and India’s Minister of External Affairs Salman Khurshid reaffirmed their countries’ strong commitment to work together based on the 2009 U.S.-India Memorandum of Understanding on clean energy, energy efficiency, energy security, and climate change. 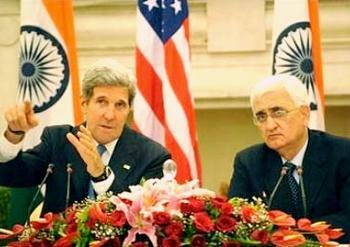 In New Delhi, Kerry and Khurshid noted cooperation under the U.S.-India Energy Dialogue, highlighting ongoing engagement in the areas of electrical grid, energy efficiency, expanding markets for renewable energy technologies and addressing barriers to clean energy deployment, shale gas resource assessments and sharing lessons on exploitation, clean coal technology development, and civil nuclear energy. “Today, we are expanding our bilateral cooperation to new horizons such as energy while intensifying existing avenues of cooperation and health, science and technology, education, space, defense, and peaceful nuclear energy,” said Kurshid at a news conference. “We share common values and goals, and we both share the will and the determination to keep pressing forward towards positive change,” said Kerry. “Together India and the United States are undertaking clean energy research. We are collaborating on development efforts, and together we believe we can do more to work on climate change. To that end, we agreed today that we would create a working group which Minister Khurshid and I will coordinate within our respective governments, in order to intensify our efforts to find out ways that we can bilaterally join together in order to address the urgency of climate change,” Kerry explained. The two sides plan to enhance the existing U.S.-India Global Climate Change Dialogue to engage in “constructive discussions” on the Durban Platform negotiations under the UN Framework Convention on Climate Change, to facilitate climate policy dialogues and exchanges, and to identify opportunities for bilateral cooperation. At the 2011 UN climate talks in Durban, world governments decided to adopt a universal binding legal agreement on climate change not later than 2015 that would take effect in 2020. India and the United States will exchange information on short-lived climate pollutants, including black carbon, Kerry and Khurshid said today. Collaborating on civil nuclear energy, Kerry and Khurshid said that over the past year, negotiations leading to the construction of U.S. nuclear power plants in the states of Gujarat and Andra Pradesh have made progress towards acquiring land. The two sides noted the ongoing commercial discussions between the Nuclear Power Corporation of India Limited, NPCIL, and Westinghouse towards setting up a nuclear power plant at Mithivirdi in Gujarat. They took note of the ongoing consultations between General Electric-Hitachi and NPCIL on building a nuclear power plant in Andhra Pradesh. The U.S. Nuclear Regulatory Commission and the Indian Atomic Energy Regulatory Board are finalizing an arrangement for the exchange of technical information to certify and license the operation in India of the U.S. nuclear power plants. Under the joint Oil and Gas Working Group, the two countries are moving toward an agreement on methane production from natural gas hydrates. In addition, the United States is helping India develop its natural gas deposits in shale formations, a process that uses hydraulic fracturing to extract the gas. Through the Global Methane Initiative, the United States and India collaborate on joint projects and programs to capture methane and use it as a clean energy source. On May 3, the U.S. Trade and Development Agency agreed to conduct a study in support of Essar Oil, a private Indian oil company, in assessing its coal bed methane license areas for the presence of commercial grade shale deposits, a potential new domestic energy resource offering a cleaner alternative to coal. Today, the USTDA signed a new agreement for a second study to support India’s privately owned Deep Industries in assessing its conventional oil and gas license areas for commercial grade shale deposits. The Department of State’s Unconventional Gas Technical Engagement Program is increasing its engagement with India by funding a tight gas and shale oil resource assessment to be concluded this year. In May, representatives of India’s Ministry of Petroleum and Natural Gas and directors of state-owned refineries visited the United States to meet with U.S. companies specializing in refinery efficiency. The delegation visited Chicago, Houston and New Orleans. On the energy efficiency side, the U.S. Department of Energy, DOE, is working in two Indian states on Energy Conservation Building Codes. The city of Jaipur in Rajasthan state and the city of Chennai in Tamil Nadu will showcase the partnership with the efficient performance of exemplary IT office buildings. DOE’s National Renewable Energy Laboratory is collaborating with India’s Solar Energy Centre to increase understanding of how solar photovoltaic modules perform in different climatic environments and to develop tests to improve product reliability. NREL is updating solar maps for India with new data obtained on aerosol optical depth from the Indian Space Research Organization. NREL and India’s Centre for Wind Energy Technology are collaborating to enhance existing wind resource characterizations for priority areas in India. Back in November 2009, Prime Minister Manmohan Singh and President Barack Obama announced the U.S.-India Partnership to Advance Clean Energy. In 2012 under PACE-Research, the two countries supported the work of three public-private U.S.-India consortia in solar energy, building efficiency, and advanced biofuels under the $125 million Joint Clean Energy Research and Development Center. The Clean Energy Finance Center, a partnership between OPIC, the Ex-Im Bank, USAID, the Department of Commerce, and USTDA has provided roughly $2 billion in renewable energy financing to India, including financing nearly 40 percent of India’s first 1,000 megawatts of installed solar energy capacity. India has long standing collaborations on environment and forestry with the U.S. Environment Protection Agency, the U.S. Forest Service and the U.S. Fish and Wildlife Service. The EPA has been an active partner with India in environmental governance and air quality, while the other agencies have collaborated for decades with India on watershed management, wildlife conservation, improving forest health and productivity, and integrated forest planning and management for conservation of India’s biological diversity. The U.S. Forest Service has conducted workshops in India on carbon monitoring and assessment, and climate adaptation and mitigation issues in the Eastern Himalayas. In 2010, the two countries signed a partnership agreement for the Sustainable Forests and Climate Adaptation program. Under President Obama’s Global Climate Change Initiative, in July 2012, the Indian Ministry of Environment and Forests and USAID began a five-year, $14 million contract to take Reducing Emissions from Deforestation and Forest Degradation (REDD+) actions to scale in India. On May 15, India was welcomed as a new Observer State to the Arctic Council. The Arctic environment is changing rapidly as a result of global climate change. India is a major player in global scientific climate studies and has a research station in the Arctic. India’s new Arctic Council observer status could enhance global science collaborations and data exchanges on climate modeling and research. Secretary Kerry began a two-week round of foreign travel in Doha, Qatar on the weekend before flying to New Delhi. Here he is attending events through Tuesday. Kerry will then travel to Jeddah, Saudi Arabia; Kuwait City, Amman, Jordan; Jerusalem, and Bandar Seri Begawan in Brunei.